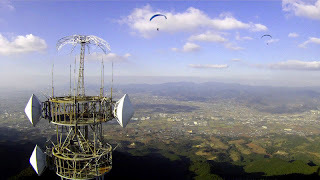 Mino, an east-to-west oriented mountain ridge about 700m high and 20km long, located in southern Fukuoka Prefecture, is one of the premier paragliding areas of Kyushu. North of the range stretches the Chikugo Plain, down the middle of which winds its namesake river, the longest in Kyushu. In the winter season the sun warms the plain, and the prevailing northerly winds carry thermals toward the range, providing for first-class soaring conditions. Strong days are common, but when the winds are light, a perfect combination of thermal and ridge wind soaring can be found here. Today we hit one of those nearly perfect days, flying with the area's master flyer Motoyama-san (black glider). 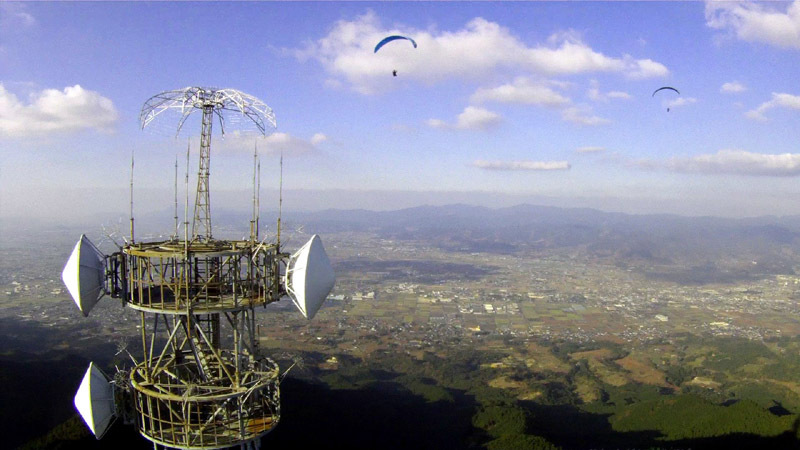 If you ever visit Kyushu with a paraglider, be sure to stop here.